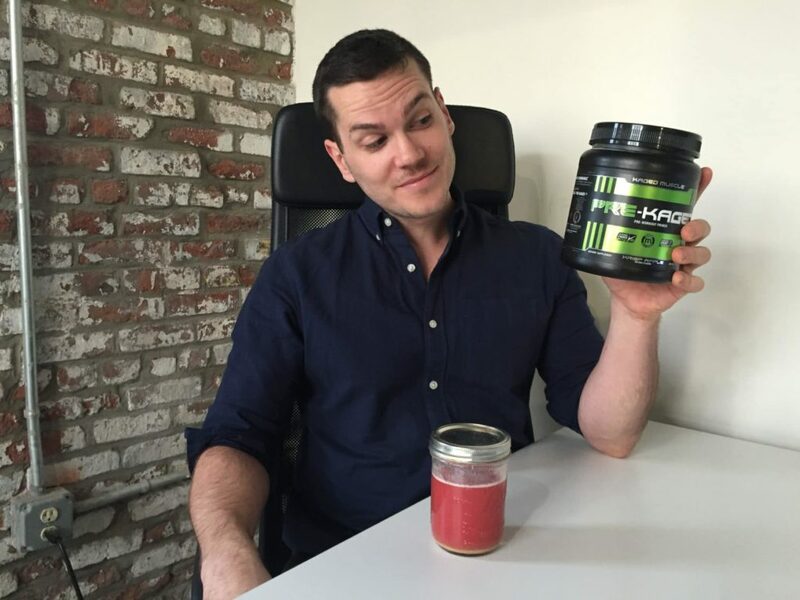 Home » KAGED MUSCLE PRE-KAGED Review — A Pre-Workout With Vegetables? 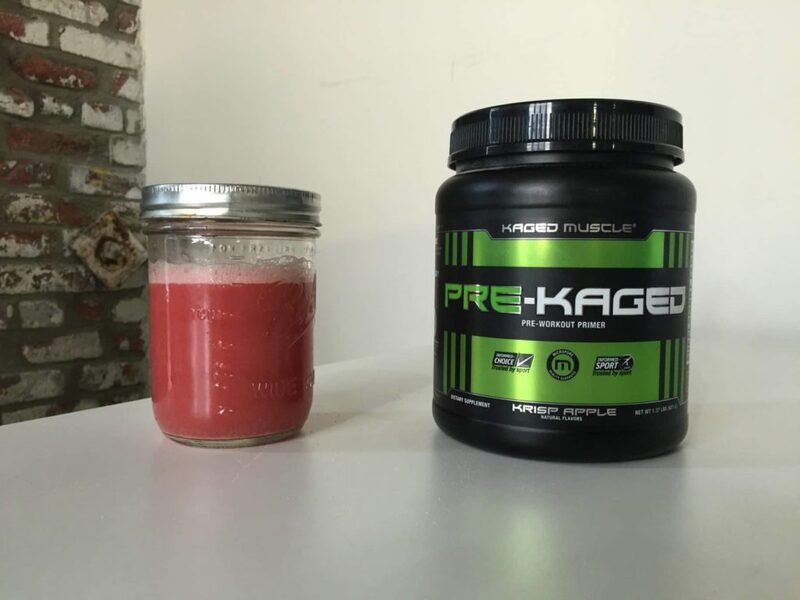 KAGED MUSCLE PRE-KAGED Review — A Pre-Workout With Vegetables? KAGED MUSCLE makes all their products in a Good Manufacturing Practices-certified facility in Idaho, and they have an unusually extensive line of supplements that includes citrulline, carnitine, and fat burners. 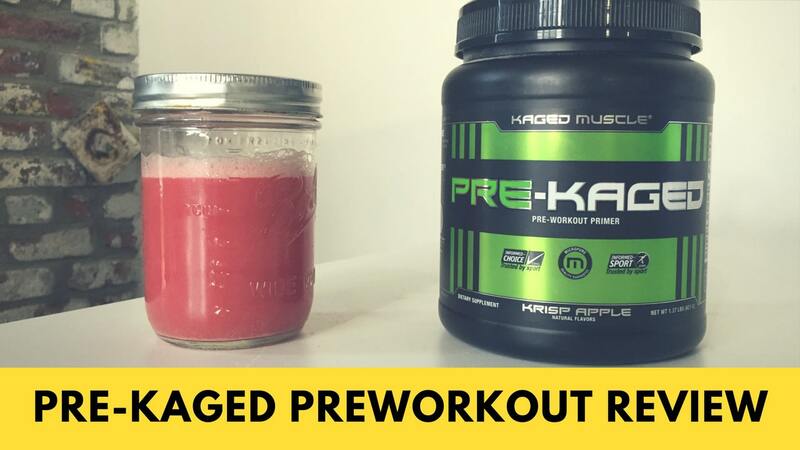 We’ve tried their intra-workout BCAAs but we wanted to try PRE-KAGED, which has one of the most unusual ingredients lists we’ve seen in a pre-workout. It’s not just high in caffeine — it contains powdered vegetables, too. Let’s take a closer look at the Krisp Apple flavor. One scoop contains 15 calories and an enormous amount of ingredients, one of the most extensive I’ve seen in a pre-workout. They’re all divided into six categories; I’ll name them all here and discuss their effects in the next section. The Neuro-Focus Matrix has the caffeine — 274 milligrams, or a little more than you’ll find in 2.5 cups of coffee — plus taurine (2g), and 1.85 grams of tyrosine from two sources. Pro-Pump has citrulline (6.5g) and quercetin (200mg). Then the Strength & Power Matrix has beta alanine (1.6g), betaine (2g), and creatine HCI (1.5g). Finally, there’s a Hydrate & Defend blend of coconut water (500mg) and a 100-milligram blend of greens called SPECTRA™, which contains dozens of concentrated vegetables and herbs including broccoli, spinach, turmeric, and oregano. The other ingredients include a few B-vitamins and a blend of anti-caking agents and flavorings. It’s worth pointing out that while it does contain the artificial sweetener sucralose, there are no artificial colors or flavorings. Note that it does contain tree nuts. There are a lot of ingredients to unpack here, so I’ll try to group them by their effect. Power: The caffeine, creatine, and betaine are all supplements that may improve power output. Blood flow: The citrulline has the strongest link with blood flow and circulation. Endurance: The beta alanine and the BCAAs have links with endurance. Focus: The taurine, tyrosine, and BCAAs are all associated with improved focus. Nutrition: There are B-vitamins in this product, but it’s worth pointing out that while they’re associated with energy production, they’ll probably only have an effect if you’re already low in these vitamins. That said, the Vitamin B6 may help with muscle retention. I was particularly impressed by the dosages in this product. A lot of pre-workouts have citrulline, beta alanine, betaine, and taurine, but they tend to underdose them. 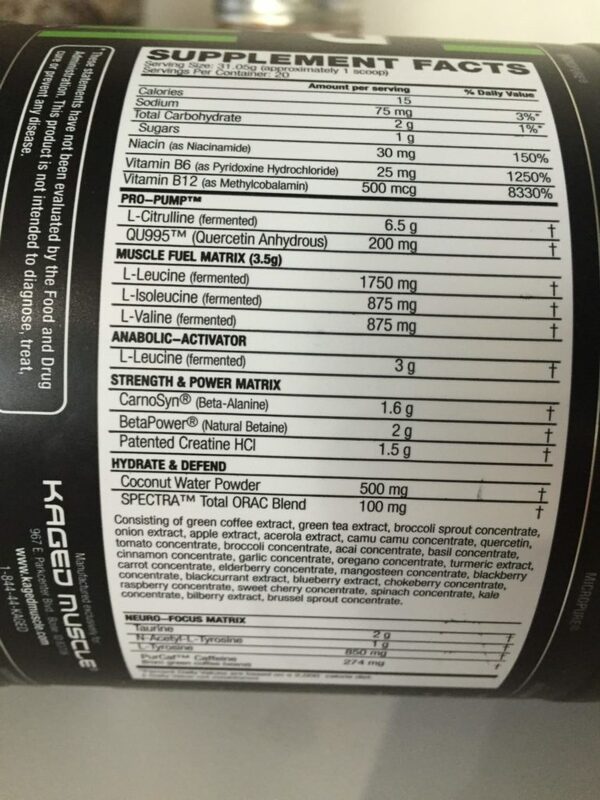 PRE-KAGED has pretty generous amounts of all of these ingredients, particularly the citrulline. You can pick up 20 servings for $36, so it’s about $1.80 per serving. That’s pricier than most pre-workouts, which average at 80 cents to $1 per serving. 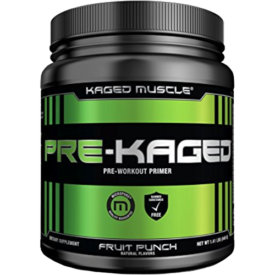 However, PRE-KAGED is a combination pre-workout, BCAA supplement, and (low dose) greens powder, plus it’s better dosed than most of its competitors. The Krisp Apple flavor was somewhat tasty, but it’s very strong, very sour, and had a slightly bitter aftertaste. That’s understandable given it contains branched chain amino acids, which are naturally bitter. I think it’ll go down easy if it’s mixed with at least 3 cups of water. I thought PRE-KAGED is a very effective supplement. It contains just about every ingredient most people look for in pre-workouts — caffeine, beta alanine, citrulline, betaine, tyrosine, taurine, betaine, creatine, B-vitamins — and a lot of ingredients people don’t usually look for, like the greens powder and the BCAAs. It is pricier than some competition and the caffeine content is high enough that you may prefer a different product or a diluted serving if you’re sensitive to its effects. But in my opinion, the price is completely justifiable for such a versatile, innovative product.